Today, I woke up at 8am to a cloudy, windy, and cold base camp. The night had been windy here and the stars were obscured by heavy cloud cover. Gasherbrum I’s summit was shrouded in clouds and I couldn’t imagine going for the summit in these conditions. 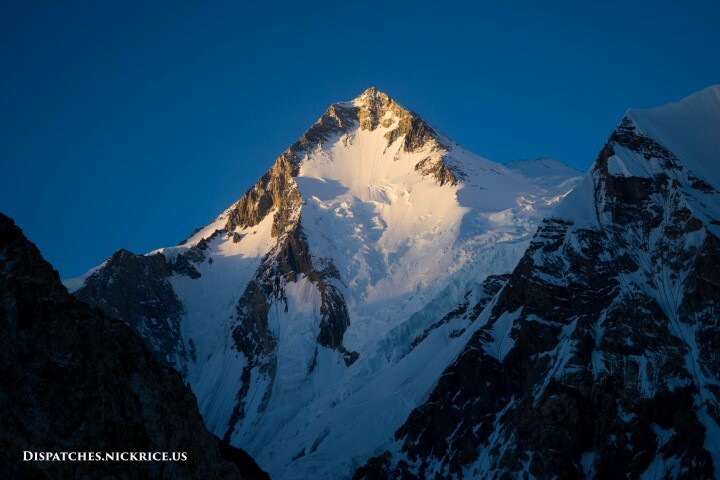 Early in the morning, the Kobler expedition began the trek down the Baltoro toward Askole. I spent the day teaching Akbar how to ice climb, rappel, and use a jumar in the nearby ice fall. Afterwards, I remade my tent platform, showered, and received a visit from Ferran’s Liaison officer, Salman. After talking for over an hour, I spent the afternoon reading in my tent. Having finished Brad Spellberg’s Rising Plague, a book that goes into detail about the rising global threat from deadly antibiotic resistant bacteria and our dwindling arsenal of antibiotics to fight them (I highly recommend it whether you’re interested in medicine or not as it discusses issues that will eventually affect all of us if new legislation is not passed in the near term to stimulate new antibiotic development by pharmaceutical companies), I began reading Leo Tolstoy’s Family Happiness and Other Stories. The late afternoon and evening cleared considerably and after dinner, I emerged from the mess tent to a breezy, but clear starry night. If teams are to summit, this will be the night that they might have a chance (though the issue of deep snow high on both Gasherbrums will remain an issue).